The Point Statistics tool performs a neighborhood operation that computes an output raster where the value for each output cell is a function of the values of any input point features that fall within a specified neighborhood around that location. The function performed on the input is a statistic, such as the maximum, average, or sum of all values encountered in that neighborhood. 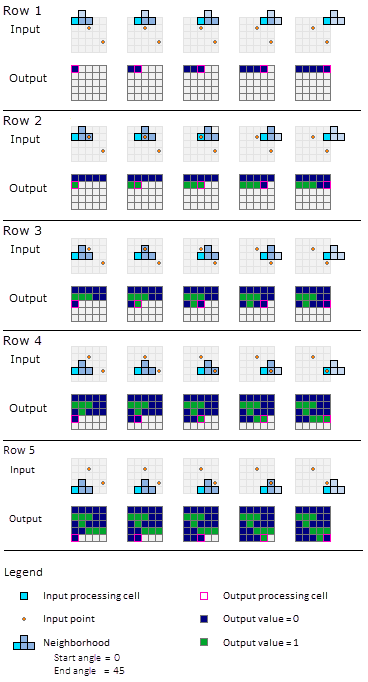 Conceptually, on execution, for each cell in the output raster, the algorithm determines which of the input points fall within the specified neighborhood around that cell. The particular statistic selected is applied to the values of the specified field of those points. The neighborhoods can overlap so that points located in one neighborhood around the processing cell may also be included in the neighborhood of another processing cell. Point Statistics is similar to the Focal Statistics tool, except that it operates directly on the point features instead of on a raster. One of the advantages of operating directly on the features is that points are not lost in converting to a raster if they are too close together. Note that there are only four defined neighborhood shapes that Point Statistics can calculate the statistics for. You can define custom neighborhood shapes with Focal Statistics. The neighborhood processing for Point Statistics calculating a Sum statistic is demonstrated here, considering an input with 11 points that have field values 1, 2, and 3. The neighborhood to be used is a 3 by 3 rectangle. For each cell in the output raster, the neighborhood window determines which of the input points are to be considered in the calculation of the statistic for the output cell value. The result of that calculation is recorded in the processing cell, and the operation proceeds to the next cell. The scan proceeds until all of the output cells have a value. To better illustrate this, the following graphic demonstrates how the values in the third row of the output raster are calculated. Since the Sum is the type of statistic operation selected, the values of all the points that fall within a particular neighborhood window will be added together. Calculations for the third scan row, with the processing cell highlighted. The neighborhood shapes are annulus, circle, rectangle, and wedge. Each shape is defined by several parameters as illustrated below. The default neighborhood is a square with width and height of three cell units. The wedge neighborhood is defined by a start angle, an end angle, and a radius. The wedge extends counterclockwise from the specified starting angle to the ending angle. The angles are measured in arithmetic degrees, with 0 degrees being measured from the positive x-axis (3:00 on a clock). In the following example, the wedge neighborhood is specified with a start angle of 0 degrees, an end angle of 45 degrees, and a radius of 2 cells. A small 5 by 5 cell extent is specified, within which there are two input point locations. The attribute for each point has a value of 1, and the statistic being calculated is the Maximum. The illustration below demonstrates the row-by-row scan process, starting from the upper left corner. The neighborhood will be iterated through each cell in the row, and the resulting output cell value will be presented. This process will be repeated for each of the rows in the output raster. Example of the wedge neighborhood scan process. It is important to understand that the tool evaluates based on which points occur in the specified neighborhood around each output cell, not what occurs in the neighborhood around each input point. The possible statistics are mean, majority, maximum, median, minimum, minority, range, standard deviation, sum, and variety. The default statistics type is mean. The output raster will always be floating point. This statistic type can only be used when the specified field is of integer type. For this statistic, the frequency of occurrence of each unique point value in a neighborhood is determined first. If there is a single value that has the highest frequency (is the most common), that value is returned as the output for that cell. However, there can be a tie, where there are two or more input values that have the same highest frequency. In this case, the processing cell location will receive the smallest of the values. The data type of the output raster will be the same as the input field type (integer or float). When the number of valid cell values in the neighborhood is odd, the median value is calculated by ranking the values and selecting the middle value. If the number of values in a neighborhood is even, the values are ranked and the lowest of the middle two values will be selected. For this statistic, the frequency of occurrence of each unique point value in a neighborhood is determined first. If there is a single value that has the lowest frequency (is the least common), that value is returned as the output for that cell. However, there can be a tie, where there are two or more input values that have the same lowest frequency. In this case, the processing cell location will receive the smallest of the values. Note that the standard deviation is calculated on the entire population (the N method); it is not estimated based on a sample (the N-1 method).